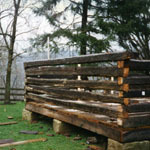 Lucille Seskes’s dream of owning a log cabin was realized in November 1996, when she purchased an 1850’s log cabin from Joe and Barb Kovach at their tag sale. 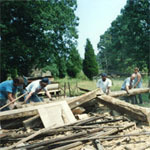 Over the years, the Kovach’s purchased four log buildings from Hazel Mitchell of Pelham, NC, and dismantled, moved, and restored these structures at their former residence in Peninsula. 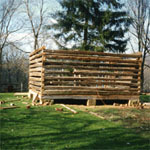 Once again the log cabin was taken apart and put back together at a new location in Peninsula–daughter Diane’s backyard. 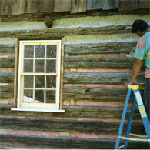 With Don Carey’s expertise, windows were added, the loft was changed, the roof was raised, chinking was replaced, and recycled floor boards were used in the reconstruction. 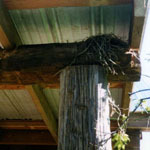 Two days after the log cabin was completed, a robin built its nest on the porch beam. This indicated to both Lucille and Diane that the 1850’s cabin was happy to be in its new home and was looking forward to a delightful future. 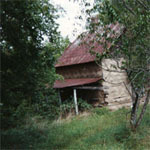 Over time, The Log Cabin Gallery was born.